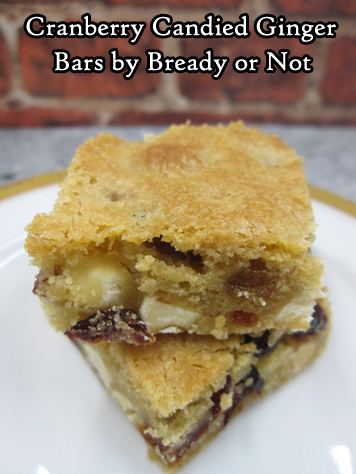 Cranberry Candied Ginger Blondies pack tart cranberries, zesty little nuggets of candied ginger, and mellow white chocolate in a chewy blondie base, to delicious results. Preheat oven at 350-degrees. Line a 13x9 inch dish with aluminum foil and apply nonstick spray. Place butter and both sugars in a large bowl and beat until creamed together. Mix in eggs and vanilla. Follow up with the flour, baking powder, and salt, until just combined. Fold in the cranberries, candied ginger, and white chocolate chips. Spread batter in the ready pan and even out. Bake for 27 to 30 minutes, until edges are firm and the middle passes the toothpick test. Cool on a wire rack. Use foil to list contents onto cutting board. Slice into pieces. Store in an sealed container at room temperature.